This is Odie checking in from the road. The BoggsMobile is Dothan, Alabama bound. We are looking forward to being with Pastor Dewayne Watson and our friends at Mt. Sinai. It was so good to be home in Ohio for several days. Check the post from this week to see the things that have been accomplished at the house that is being built for me to live in. It is exciting times at The Lazy OD Ranch. I am thrilled that the house is almost completed. Have you ever heard of Flat Stanley? The book Flat Stanley was written by Jeff Brown and was first published in 1964. It has been published several times with some variations to the story. You can read more about it here. I first read a story about Stanley when I was a little girl and I loved the story then. I have never forgotten it. Here is a shortened version of the story. Stanley Lambchop lived with his parents and brother, Arthur. Stanley and Arthur shared a bedroom and their father gave them a bulletin board for their room. They hung the board above Stanley’s bed and displayed their pictures and posters. One morning when they awoke the board had fallen on top of Stanley and flattened him. He was as flat as a pancake. Stanley adjusted to his new life of being flat. He was able to do several cool things because of his flattened state. He even went to visit friends in California through the mail because he could fit in an envelope. He helped catch thieves because he could hide easily. At the end of the story his brother pumped him up with a bicycle pump to make him big again. My little buddy Drew Nicholson from Richton, Mississippi, learned about Stanley with his first-grade class. Drew sent his Flat Stanley to visit me and go some of the places I go for a few weeks. I think Stanley had a good time with me and my family. We have lots of pictures from some of our adventures in Texas, Louisiana and Mississippi. Today I am letting you in on the fun. I hope you enjoy. Here is Flat Stanley in Livingston, Texas playing piano and singing. Hanging out with me before church. He found a place to ride in my wheelchair pocket. I knew that some of my friends would want to meet Flat Stanley. Here he is meeting new friends Scarlet and Presley. In Baton Rouge, Louisiana he was keeping germs away. Stanley did not want the flu. He loved the delicious Mexican food in Baton Rouge. Look at that smile. He visited Hattiesburg, Mississippi with me and Deidre. He enjoyed a latte from Starbucks. He had some Hobby Lobby fun. Flat Stanley has no fear. He even went swimming with the sharks. He literally shopped 'till he dropped! Here he is in Ellisville, Mississippi with Rylee and Kim Morris. 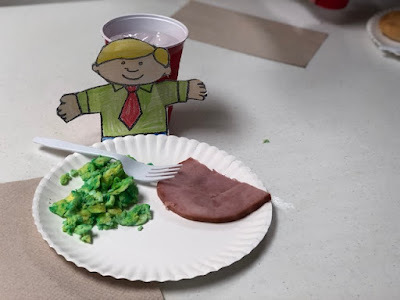 And eating reen eggs and ham, Sam I am. He joined the Cat in the hat club and met new friends at the school. Ethan Morris took him all around First Assembly. Then it was time for Stanley to return home to Drew Nicholson. Thanks, Drew, for sending Stanley on a road trip. I think he made memories that will last a life time. Did you read the Flat Stanley book as a kid? Thank you for stopping by to visit today. I hope you have a good weekend.